Gold's chart is glittering here. Gold is glittering this October - and miners are proving to be one of the best ways to play the trend. Since bottoming back in the middle of September, the average gold mining stock has surged around 15% higher, vs. a 3.3% stumble in the S&P 500 over that same time frame. That's not totally surprising. After last week's big "risk off" moment on Wednesday and Thursday, a flight to quality to gold isn't totally surprising. But if you think that the upside in gold is all due to the volatility spike, you're missing out on at least half the story. 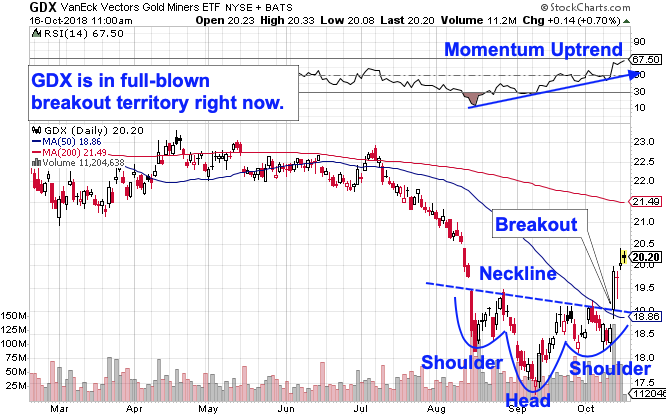 To figure out what's happening in gold and miners here, we're turning to the charts to take a technical look. One of the best investible ways to look at gold miners as a group is with the popular VanEck Vectors Gold Miners ETF (GDX - Get Report) . GDX holds 49 different global publicly traded gold mining stocks. After a nasty start to 2018, GDX spent much of the late summer forming a pretty textbook example of a bullish reversal pattern. In other words, there was an early warning sign that sellers were getting fatigued. The emphasis here is on early warning - we actually last looked at this technical setup back in late September, before the breakout (and buy signal) actually happened. Now that it has, it makes sense to give a second look at how to trade it from here. For investors looking for a good way to get leveraged exposure to gold, GDX remains a great way to do it. That's because as the value of gold moves further above a miner's cost of production, profitability scales up dramatically. For example, with all-in-sustaining costs for gold miners averaging $949 in the final quarter of last year, a $125 increase in gold prices represents a mere 11% boost for spot gold prices, but nearly a 50% increase in miners' margins. And the price action supports higher gold prices this fall. After last week's substantial breakout from the inverse head-and-shoulders pattern in GDX, this exchange-traded fund is cooling off a bit. Even so, gold bulls aren't profit-taking despite a substantial up-day in the rest of the market. That's a constructive sign. Momentum, measured by 14-day RSI at the top of the GDX chart, adds some extra evidence that buyers remain in control of things. Momentum is hanging onto its uptrend here. Expect GDX to consolidate a bit after the upside move before trying to establish some higher ground. Short term, this might be a good opportunity to take some gains off the table, but longer-term, it looks like we're seeing an overdue change in trend for gold prices.